Not all Envelope Sealing Fluids Are Created Equally! Penetron Sealing Solutions activate envelope seals, won't clog your sealing machinery, and enhance the performance of water activated adhesives where hard water is used. Penetron products also help to dissolve hard water buildups and reduce bacteria in standing water. Using filtered, ionized and softened water, we have produced both an effective sealing solution and improved the life of sealing mechanisms and sponges, rollers and squeegees in these mechanisms. That means less cleaning and lower maintenance costs for the end user. Our premixed Penetron sealing fluids are all carefully mixed with demineralized water. 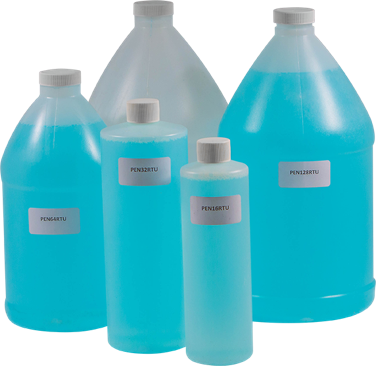 These smaller size premixed bottles are ideal for postage meter users and small to mid-size inserter users. For bulk users and tape dispensers, our super concentrate is the most economical way for heavy users to cut costs. For mid-size users, our concentrate is already in the one gallon container so shipping is a breeze and less expensive, your customer simply fills the gallon container with water.